On 19th February 2002, exactly five years ago, the STF was on a 72 hour ambush in the Kanchikudichchiaru forest reserve in Ampara to trap few LTTE cadres in hiding. The ambush suddenly came to a halt even before accomplishing its mission. 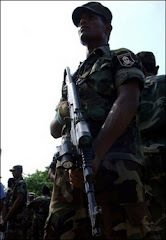 The STF's attempt to protect Ampara from the LTTE had to be abandoned with the signing of the Cease Fire Agreement three days later on 22nd February 2002. The ambush on 19th February 2002 was not the STF's first attempt to drive out the LTTE. Their efforts date further back to 1991. The STF launched a massive operation in Kanchikudichchiaru in 1991 following the LTTE massacre of 600 policemen in Thangavelayudapuram in 1990. The STF recovered the remains of the massacred police personnel towards the end of 1990. Intelligence sources had confirmed that the LTTE had just begun to establish camps in the area. After a successful operation, the STF dominated the area till 1995. However, due to political blunders the STF couldn't hold ground. To fulfill a short sighted political strategy, the STF was once again compelled to abandon the liberated Kanchikudichchiaru area to support the 'Riviresa' operation launched on 17th October 1995 to liberate the Jaffna peninsula and to wrest control of the A-9 road. The STF withdrew from Kanchikudichchiaru opening the doors for the LTTE to gain control of the area again. Ever since 1995, the LTTE has been growing from strength to strength in Ampara controlling the daily life of civilians. Today, after 15 years of its first attempt, the STF has once again regained control of a considerable area of the Kanchikudichchiaru forest reserve. The 'Niyathai Jaya' operation launched on 4th January 2007 is the STF's third attempt in clearing the Kanchikudichchiaru. The Special Task Force under the ‘Niyathai Jaya’ operation has captured over 20 LTTE bases and satellite camps. On 1st February 2007 the STF captured the "Jeewananda Base” of the LTTE used for cadre training. Intelligence sources had confirmed that the tigers were using this base to train conscripted children while attacking the Security Forces at regular intervals. Intelligence sources had also confirmed that the LTTE had planned to link the Eastern coastal belt from Vakarai to Verugal with Thoppigala and Kanchikudichchiaru in Ampara. The Special Task Force launched the Niyahai Jaya operation on 4th January to liberate the Kanchikudichchiaru forest reserve from the LTTE. Speaking to MCNS, the Director Operations of the STF, SSP Ajith Wickremasinghe said that the presence of LTTE cadres in Kanchikudichchiaru had posed a serious threat on civilian settlements in the vicinity. The LTTE backed by infrastructure facilities in the area was controlling the daily life of Sinhalese, Tamils and Muslim villagers. Complaints from the public against the LTTE’s abductions, extortions, forced recruitment, illegal timber, cannabis and ivory trade were on the rise, he further said. On 18th December 2006, a group of LTTE terrorists abducted 22 school children and two teachers from a tuition class in Tirukkovil, Ampara. Civilian sources confirm that the children were forced into a van at gun point. The van was seen speeding towards the Kanchikudichchiaru area. Among the abducted school children were 7 boys and 15 girls. Following the abduction, a LTTE spokesman was quoted by foreign media as saying that the mass abduction of schoolchildren at Tirukkovil was a “serious mistake”. However, the LTTE was later compelled to release the school children due to enormous pressure exerted by their parents and the media. On 2nd January 2007 in BAKMITIYAWA, a postman, his wife and two others (all Sinhalese) were abducted and killed by the LTTE. Subsequently, an 18 year old boy, Dayananda was abducted by the LTTE and the STF launched a search operation to find the boy. Later on the students of the MADAWALALANDA MAHA VIDYALAYA staged a protest against LTTE abductions. Further, LTTE atrocities have denied farmers from using the KANCHIKUDICHCHIARU tank for irrigation. Fertile land in Pavattakulam, Vattamadu, Rufaskulam, Venmeadikulam, Kottevihara and Thangavelayudapuram, historically known as Deeghavapi has been denied for paddy cultivation by the LTTE. Legend says that King Dutugemunu sent his brother to cultivate in the Deeghavaphi area. The abundant harvest and prosperity of Deeghavapi earned it the name, ‘The Granary of the East.’ According to legend, King Dutugemunu had visited the area and used water from the tank to prepare kanji, a thick broth made out of rice, coconut milk and water. Thus the tank is known as Kanchikudichchiaru, meaning ‘Kanda biuwa oya’ in Sinhala. In Tamil ‘kanji’ refers to thick broth while ‘kudingal’ and ‘aru’ means drinking and river respectively. The STF says that the rocky area of Gandamegoda still bares evidence of ancient Buddhist shrines. Evidence also suggests the existence of Buddhist monks in ancient times. However, much of these sites have been plundered and destroyed by vandals. On the first day of the 'Niyathai Jaya' operation, the STF sealed off the entry points to the Kanchikudichchiaru area. Police Commandos advancing from four directions cleared the area up to the LTTE cemetery. Then they set up satellite bases around the area. Following the establishment of satellite bases troops pulled back surprising the enemy. The STF was backed by the Air Force Kfir jets that bombarded the area ahead forcing the LTTE cadres to flee in disarray. In some LTTE satellite bases pots of rice and cooked food had been left behind by fleeing tiger cadres. Day 6 and 7 of the 'Niyathai Jaya' operation brought heavy rains to the Ampara district. STF commandos couldn’t advance ahead of the cemetery due to heavy rains. However, they got the support of the Sri Lanka Army to bombard tiger hideouts with barrages of artillery amidst heavy rains which left the LTTE in total disarray. SSP Ajith Wickramasekara said that they knew exactly where LTTE camps were located. ‘Niyathai Jaya’ operation is based on a combination of “strong intelligence and tactics”, he further added. Inside the Kanchikudichchiaru forest reserve certain LTTE camps have been located within a high security zone under thick forest cover with 24 hours of electricity supplied by 50 KV and 25 KV generators. These camps were believed to have been used by LTTE leaders. Evidence also indicates that access to these camps had been restricted to ordinary LTTE cadres. The PARAMANANDA base had been used by PARAMANANDA MASTER, the LTTE leader in charge of explosives. The STF recovered a 29" Flatron TV and a DVD player from the PARAMANANDA camp. From other bases used by leaders, STF troops recovered 29" Flatron TVs, generators, Nissan vans, double cabs and satellite phones. According to the STF, most of the luxury vehicles left behind by the LTTE were booby trapped to cause maximum damage to advancing police commandos. However, the STF has been successful in overrunning LTTE camps with minimum casualties to own troops. Elite cops also recovered around 30 generators both portable and fixed, water pumps, and other vehicles from the overrun LTTE camps along with 4 main storerooms packed with large quantities of tsunami aid including canned food, dry rations, sanitary, tents, large number of mosquito coil packets and sleeping bags. Almost all LTTE underground bunkers were roofed with sand bags made out of tsunami aid sacks. To the surprise of the STF some infrastructure that the LTTE had been using inside Kanchikudichchiaru carried the names of some INGOs. According to defence analysts, chasing out the LTTE from Kanchikudichchiaru will further paralyze their recruitment from that region. According to statistics LTTE has conscripted 229 children from both Batticaloa and Ampara since the Ceasefire Agreement up to 13th January 2007. 441 LTTE cadres who have been killed since the CFA up to 2005 have been from the Ampara district. There has also been an increase in the number of LTTE surrendees from the East. "I ran away from the LTTE 15 days after I was abducted but I couldn’t run very far. They caught me and beat me severely. It was Pahulmaran, the camp’s training master who hit me. He tied me to a tree for three days as a punishment for trying to escape”, revealed a 16 year old cadre, the youngest out of the five that surrendered to the STF camp in Sangaman Kanda in Ampara on 15th January 2007. These youth, residents of Tirukkovil, had been abducted by the LTTE in November last year and taken to a camp on the other side of the Kanchikudichchiaru tank, further interior of the forest reserve. The STF's 'Niyathai Jaya' operation to liberate the Kanchikudichchiaru forest reserve from the LTTE paved the way for these youth to escape the Tigers. Since the operation was launched 7 LTTE escapees have surrendered to the STF. Almost all LTTE surrendees have said that they trust the security forces. The presence of the Security Forces has also minimized the chances of their families being harassed by the LTTE. Today, the STF has cleared a considerable area of the Kanchikudichchiaru forest putting an end to abductions, forced recruitment, extortions, illegal timber and ivory and cannabis trade. “The key reason to launch ‘Niyathai Jaya’ was to chase away the LTTE from this area. The LTTE was a huge threat on people in this area. Once the area is cleared people could peacefully engage in their livelihood and use the natural resources of this fertile area without any intimidation or harassment from the LTTE” S.S.P. Ajith Wickramasekara said. He also said that the STF is planning to rebuild the infrastructure so that people could engage in paddy cultivation especially in the legendary eastern granary of Deeghavapi.